Youthtrain began in 1998 as a European Social Funded Partnership Project and at this time involved six partner organisations from Bradford, Derbyshire, Kirklees, Wakefield, Bath and North East Somerset and the National Open College Network (NOCN). The success of this pilot project led to Youthtrain’s development as a national programme available through all regional Open College Network offices. Since it began, Youthtrain in Bradford has developed strong working partnerships with more than 50 local, regional and national organisations. 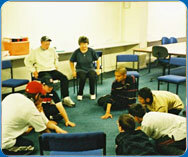 The Bradford Youthtrain Project took the lead role in establishing Youthtrain as a national programme in 2003 and since this time has operated as the Youthtrain National Office, with the responsibility for publicising the programme on a national level, responding to enquiries from across the UK and supporting the growth of the programme nationally. Youthtrain was also a member of the Network for Accrediting Young People’s Achievements (NfAYPA), a partnership of key national accrediting bodies in non-formal education, led by the National Youth Agency. Youthtrain now offers a wide range of accreditation and nationally recognised Qualifications via distance learning courses, email and face to face training. Youthtrain also offers personal life coaching meetings and management consultancy. For more information contact us via our contact page, or at info@youthtrain.org.uk, or by phone on 01274 493137. "I enjoyed the training and made a lot of new friends." "My confidence has grown. I have improved my interview skills and communication skills." "I have learnt a lot of different skills and feel more confident about myself."